Using a Tactical flashlight - Florida Carry, Inc.
One of the most important self defense tools that you can have is a tactical flashlight. When you consider that a fair share of crime happens between dusk and dawn, you must also consider that there is a different dynamic associated with self defense in a dim light situation. Do you practice martial arts or self defense in a well lit environment? Do you shoot at a well lit range? Why do police officers always have a flashlight? Have you ever practiced your self defense tactics in the dark? It is often said that when the excrement hits the fan, you will not rise to the occasion; you will revert to the level of your training. 50% of our day, more or less, takes place between dusk and dawn and according to the FBI more than 74% of all shootings occur during darkness or in places of dim light. Have you spent at least 25% of your training time, working on dim light training? These are some of the questions that you should ask yourself when you evaluate your preparedness and training. Usually, when confronted with a self defense situation, we are forced to be reactionary. This means we are usually already behind the eight ball in a self defense encounter. How can we try to tip the scales in our favor? A good tactical flashlight is one implement that can help give you the upper hand, especially if you know how to use it. Flashlight technology has come a long way. It seems that not that long ago, a foot long "mag light" style flashlight was considered “state of the art". Today’s modern tactical flashlights are much smaller and more powerful than the flashlights of yesteryear. The modern tactical flashlight can also be expensive, often times well over a hundred dollars for a good “top of the line” model. Since tactical flashlights are made to be used in self defense situations where lethal force is likely to be used, quality and reliability is a must. The flashlight technology has gone from a standard incandescent filament bulb to the xenon bulb and as of late, the preferable high power LED bulbs. LED bulbs are definitely the way to go because they offer longer battery life and are usually up to five times brighter than the older xenon bulbs which replaced the older still standard filament bulb. LED bulbs will not break due to the shot recoil of a firearm, the way that the older bulbs would. Battery technology has also changed with the newer flashlights. Advances have gone from the standard alkaline battery, to the lithium battery to the newer and better technology of the rechargeable batteries. The lithium batteries can be a bit more expensive than a traditional battery, or you can save money by going with rechargeable batteries. These are not the crappy rechargeable batteries that you remember from the past, today’s rechargeable battery is actually quite impressive. Weapon mounted lights are a viable option and are usually available for most any gun whether it be a shotgun, rifle, or a handgun. I personally prefer a hand held flashlight for many reasons, although I have weapon mounted lights on both my home defense shotgun and my M4 carbine. Weapon mounted lights offer hands-free use, leaving the operator free to use both hands to control the firearm. A disadvantage of a weapon mounted light is that the beam of light will give away the location of its user and the light is aimed parallel to the bore, which means that you will be pointing the gun at anything you wish to illuminate. For me, I use weapon mounted lights for weapons that require the use of both hands. For handguns, I believe that a hand held light is best. Hand held lights are much more versatile and can be used tactically as well as for any other application that a flashlight can be used for. There are many positions that can be used to allow the light and handgun to be held parallel and provide mutual support, or the light can be held off to the side of the body to present a false target to a potential assailant. Typically the handgun is held in the strong hand and the light is held in the weak hand. 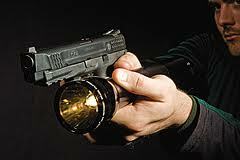 Unlike the weapon mounted light, the hand held light may be used to illuminate areas that may or may not contain a target, without pointing the handgun at the area. If a target is detected, the handgun can quickly be brought into line to cover the target. The hand held light also allows the light to be turned on or off as needed, additionally the light might have other features such as a dimming or a strobe feature, that become more user friendly with a hand held light. Furthermore the light can be turned off to minimize the ability of an attacker to locate you. There are many good quality tactical flashlights on the market today. Some of the most popular brands on the market today are: Streamlight, SureFire, ICON, Elzetta, Energizer, Fenix, Fox Fury First-Light-USA, , Inova, Insight Tech, Maglite, Nitecore, Novatac, OLight, Phoebus Tactical, and many, many more. Shop carefully, try some out, ask people what they use, and get the best flashlight for your needs. My everyday carry tactical flashlight is the Surefire E2D LED and my duty tactical flashlight is the rechargeable Streamlight Strion LED. A must have feature is a push-button tactical tail switch that will allow One-handed operation. Both of my flashlights have this feature. I really like both of these flashlights and I use them both quite frequently. I try to always be prepared and part of my preparations include having a flashlight with me at all times. One of the main advantages of a tactical LED flashlight is the ability to overwhelm an aggressor's night-adapted vision. I recommend a minimum of 160+ lumens, this will prove to be more than enough to temporarily disorient the attacker when you shine the light in the attackers eyes. This tactic can buy you precious seconds that may help you shift the odds in your favor. Another critical advantage would be identifying your target. Is there ambient light? Is there no light? Whatever the case may be, the flashlight will help you identify your target and what is beyond and you better be sure of your target. Your stance is something that you need to establish, try out the following methods, find what works and is most comfortable for you, and then practice, practice, practice. Hopefully you have already practiced a stance that works for you, and hopefully you have also practiced variations of your stance. The variations of your stance can be used in different situations, such as: shooting on the move, shooting from the prone position, shooting from a kneeling position, etc… Remember when a critical situation arises, you will most likely not be in a “range” environment and you will have to adapt “on the fly” to the situation at hand. Now let’s incorporate holding a flashlight to the equation. How does it affect your stance? This hands-together technique, which was developed for, and is limited to, use with older-style flashlights possessing side-mounted switches, works well with large and small versions of the veteran illumination devices. The method is easily assumed by isosceles or modified-isosceles shooters, but difficult to accomplish for those with small hands or when using a heavy flashlight. The latter is of particular concern when the approach is utilized for extended periods. 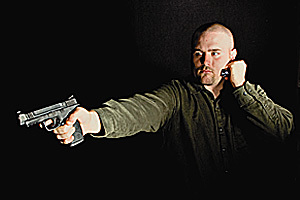 The Chapman technique is accomplished by grasping the flashlight in a "sword" grip, with the thumb and forefinger circumventing the body, while the remaining fingers wrap around those purchasing the handgun. This approximates a normal, two-handed firing grip, and the arms provide isometric tension. 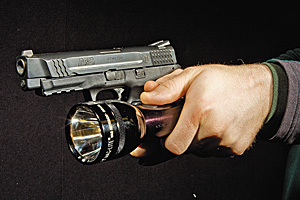 Like the Chapman technique, the hands-together Ayoob method is restricted to side-mounted-switch flashlights, and it's fatiguing for extended use with heavier models. The benefits are that it requires less training to master than most approaches and isometric tension stabilizes the gun and light for improved accuracy. 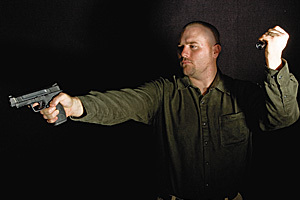 Employing the Ayoob technique requires the shooter to grasp the flashlight with a "sword" grip with any finger on the side-mounted switch, then thrusting both hands to an approximate isosceles position and ending with both thumbs touching. The latter action creates isometric tension that steadies the firearm. Although developed for use with large-bodied flashlights, the Harries technique works equally well with smaller tactical lights, thereby earning this hands-together method its go-to status. As the approach was created for use with large flashlights—a heavy flashlight may be rested on the shooting hand's forearm—this method is less fatiguing during extended use than many others. A hitch, though, is the Harries technique offers poor ergonomics for anything other than the Weaver stance. 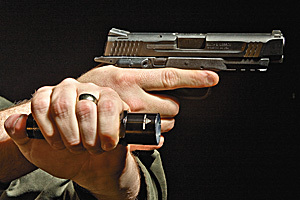 For the Harries method, the flashlight is maintained in an "ice pick" grip while the handgun is thrust forward, at which point the non-shooting hand crosses beneath the handgun-retaining arm. The technique finishes with the backs of the hands against one another, creating isometric tension for stability. The type of flashlight—tailcap pushbutton or body-mounted switch—determines whether the thumb or another finger operates the switch. The Rogers technique, which was later refined by SureFire for use with the company's grip-ring-equipped Combat Lights, allows for rapid flashlight deployment when it's being carried in SureFire's Combat Light holster. This hands-together method closely approximates a normal, two-handed firing grip, but is restricted to only small, pushbutton-equipped flashlights. To perform the Rogers/SureFire approach, the flashlight is held between the forefinger and middle finger of the non-firing hand with the tail cap pushbutton positioned against the palm/base of thumb, forming what could be considered a "syringe" grip. The flashlight hand is then brought together with the firearm hand, with the two unused fingers of the light hand wrapping around the gripping fingers of the weapon hand, as to attain a normal, two-hand firing grip. The light is activated by exerting pressure to depress the tailcap pushbutton. This hands-apart technique prevents the user from "marking" his position—through the use of intermittent light at random heights—and draws fire away from center-of-mass, as well as provides easy transitioning to and from the Neck-Index method. It works well with large and small flashlights and allows for ambidextrous shooting. Its disadvantages include difficultly in maintaining the flashlight beam on the threat and fatigue in extended use. Additionally, implementing this method with an injured hand or arm would be arduous, and the approach requires extensive practice to perfect. The Modified FBI technique is accomplished by holding the flashlight in a "sword" or "ice pick" grip with the arm extended away from the body and the gun hand. To prevent the user from self-illumination, the flashlight is held slightly in front of the body. 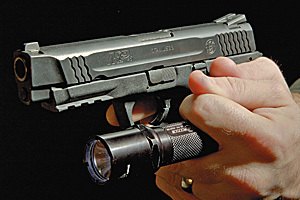 Another hands-apart handgun option, the Neck-Index technique, works with large and small flashlights alike, as well as those possessing varying switch configurations. This method offers fast deployment, provides simultaneous illumination of sights and the threat and easily transitions to and from the Modified FBI technique. The flashlight always illuminates the direction the user's looking; it's in line for use as a striking tool (with larger versions) and the technique can be used with an injured limb. The problems, however, are that it can create excessive reflection off the rear of the handgun, and most importantly, it draws fire toward the shooter's head. The Neck-Index technique is achieved by holding the flashlight in an "ice pick" grip against the jaw/neck juncture below the ear, so it moves with the user's head with minimal blocking of the peripheral vision. For larger flashlights, the body can be rested on the shoulder and indexed against the base of the neck. Depending on the type of flashlight, either the thumb (tail cap pushbutton) or another finger (side-mounted switch) operates the switch. • As a general rule, moving to the lowest level of light provides more concealment than operating in areas with higher levels of light. • In a low-light environment you are most visible and vulnerable when backlit. • Keeping the flashlight on continuously may make searching easier, as well as reassuring, but it also makes you a target while letting the aggressor know how far you are from his position, what direction your are coming from, and when you will be there. • Activating the light away from centerline, at intermittent and irregular intervals, while alternating the light position from low to high, will confuse your opponent while making it harder for them to determine your position. • In most cases—when searching for, or engaging a hostile subject—constant light should only be used in two situations: (1) when your are backlit and cannot move to a less backlit position, and (2) when your subject has been located and is not an immediate threat. • When searching for or engaging a known-deadly force threat, your gun, flashlight and eyes should be aligned to the same point of focus. When you reload in low light encounters, don’t put your flashlight in your back pocket. If you light yourself up, you will look like an angel or the tooth fairy…. and you are going to be one of them pretty soon. I encourage you took seek out training and practice. Find a low light tactical course from a qualified instructor. Try wearing really dark sun/safety glasses next time that you are at the range. Mastery of these skills could be the difference between life and death and by taking your training and practice seriously, you will gain the winning edge. Stay safe! !